Please be aware that if your dinner reservation is before 7:00 PM, we may need the table back for a second seating, especially on weekends. We allow 2 hours for tables of 2 guests, 2.5 hours for tables of 3 or 4 guests, and 3 hours for tables of 5 or 6 guests. If your reservation is at 7:30 PM or later, the table is yours for the evening. 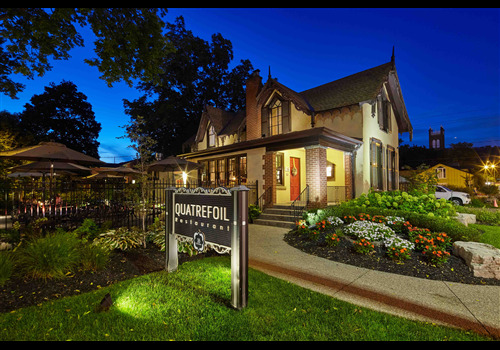 Quatrefoil Restaurant offers fine dining in downtown Dundas, Ontario. Chefs Fraser Macfarlane and Georgina Mitropoulos use local ingredients to create contemporary French cuisine in a sophisticated environment.